Marcus Aurelius (/ɑːˈriːliəs/ or /ɑːˈriːljəs/; Latin: Marcus Aurelius Antoninus Augustus; 26 April 121 – 17 March 180), called the Philosopher, was a Roman emperor (ruling from 161 to 180) and Stoic philosopher. He had Lucius Verus (161–169) and Commodus (177–180) as junior emperors. Marcus was the last of the rulers traditionally known as the Five Good Emperors. He is also seen as the last emperor of the Pax Romana, an age of relative peace and stability for the Empire. His personal philosophical writings, now commonly known as Meditations, are a significant source of the modern understanding of ancient Stoic philosophy. They have been praised by fellow writers, philosophers, and monarchs – as well as by poets and politicians – centuries after his death. Marcus was born to a praetor and a wealthy heiress. After Marcus' father died in 124, his paternal grandfather raised him. He was educated at home, as children from Roman aristocratic families often were, and later credited his maternal grandmother's step-father Lucius Catilius Severus – who helped Marcus' grandfather to raise him – for his education. His tutors included the artist Diognetus, who may have sparked his interest in philosophy, and Tuticius Proclus. Marcus was betrothed to the daughter of Lucius Aelius, his relative Emperor Hadrian's first adopted son and heir. Aelius died in 138 and Hadrian chose as his new heir Antoninus Pius, the husband of Marcus' aunt, on the condition that Antoninus adopt Marcus and the son of Aelius, Lucius Commodus. 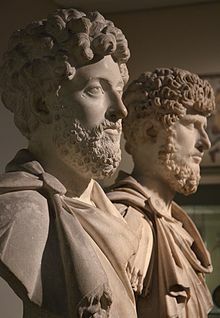 Antoninus became emperor later that year upon Hadrian's death, and Marcus and Lucius became joint heirs to the throne. While imperial heir, Marcus studied Greek and Latin. His tutors included Herodes Atticus and Marcus Cornelius Fronto. He kept in close correspondence with Fronto for many years afterwards. Marcus was introduced to Stoicism by Quintus Junius Rusticus and perhaps by other philosophers such as Apollonius of Chalcedon. He was appointed as a quaestor, as the symbolic head of the equites (a social class), and three times as consul: with Antoninus in 140 and 145 and with Lucius in 161. On 7 March 161, Antoninus died; Marcus and Lucius succeeded to the throne. Marcus' reign was marked by military conflict. In the East, the Roman Empire fought successfully with a revitalized Parthian Empire and the rebel Kingdom of Armenia. Marcus defeated the Marcomanni, Quadi, and Sarmatians in the Marcomannic Wars. However, these and other Germanic peoples began to represent a troubling reality for the Empire. Marcus modified the silver purity of the Roman currency, the denarius. Persecution of Christians is believed to have increased during his reign. The Antonine Plague that broke out in 165 or 166 devastated the population of the Roman Empire. It caused the deaths of five million people, a quarter of those it affected. Marcus never adopted an heir unlike some of his predecessors; he and his cousin-wife (Antoninus' daughter) Faustina, whom he married in 145, had at least thirteen children including Lucilla – who married Lucius Verus – and Commodus – whom Marcus named as his co-ruler in 177. 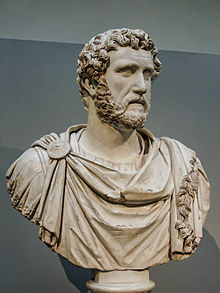 Marcus became the first emperor to die with a living biological adult son since Titus succeeded his father Vespasian a century earlier, but Commodus is considered a disappointment as emperor and his succession has long been the subject of debate among both contemporary and modern historians. The Column and Equestrian Statue of Marcus Aurelius still stand in Rome, where they were erected in celebration of Marcus' military victories. Marcus' family originated in Ucubi, a small town south east of Córdoba in Iberian Baetica. The family rose to prominence in the late 1st century AD. Marcus' great-grandfather Marcus Annius Verus (I) was a senator and (according to the Historia Augusta) ex-praetor; his grandfather Marcus Annius Verus (II) was made a patrician in 73–74. 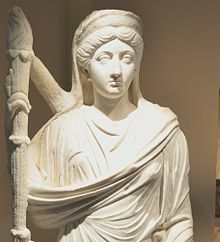 Through his grandmother Rupilia, Marcus was a member of the Nerva-Antonine dynasty; the emperor Trajan's sororal niece Salonia Matidia was the mother of Rupilia and her half-sister, Hadrian's wife Sabina. [note 1] Like Trajan and Hadrian, he was of Spanish (Latin: Hispanus) origin. Marcus' sister, Annia Cornificia Faustina, was probably born in 122 or 123. His father probably died in 124, during his praetorship, when Marcus was three years old. [note 2] Though he can hardly have known his father, Marcus wrote in his Meditations that he had learnt 'modesty and manliness' from his memories of his father and from the man's posthumous reputation. His mother Lucilla did not remarry and, following prevailing aristocratic customs, probably did not spend much time with her son. Instead, Marcus was in the care of 'nurses', and was raised after his father's death by his grandfather Marcus Annius Verus (II), who had always retained the legal authority of patria potestas over his son and grandson. Technically this was not an adoption, the creation of a new and different patria potestas. Lucius Catilius Severus, described as Marcus' maternal great-grandfather, also participated in his upbringing; he was probably the elder Domitia Lucilla's stepfather. Marcus was raised in his parents' home on the Caelian Hill, which he would affectionately refer to as 'my Caelian'. It was an upscale area with few public buildings but many aristocratic villas. Marcus' grandfather owned a palace beside the Lateran, where he would spend much of his childhood. Marcus thanks his grandfather for teaching him 'good character and avoidance of bad temper'. He was less fond of the mistress his grandfather took and lived with after the death of his wife Rupilia. Marcus was grateful that he did not have to live with her longer than he did. Marcus was educated at home, in line with contemporary aristocratic trends; he thanks Catilius Severus for encouraging him to avoid public schools. One of his teachers, Diognetus, a painting master, proved particularly influential; he seems to have introduced Marcus Aurelius to the philosophic way of life. In April 132, at the behest of Diognetus, Marcus took up the dress and habits of the philosopher: he studied while wearing a rough Greek cloak, and would sleep on the ground until his mother convinced him to sleep on a bed. A new set of tutors — the Homeric scholar Alexander of Cotiaeum along with Trosius Aper and Tuticius Proculus, teachers of Latin[note 3] — took over Marcus' education in about 132 or 133. Marcus thanks Alexander for his training in literary styling. Alexander's influence – an emphasis on matter over style and careful wording, with the occasional Homeric quotation – has been detected in Marcus' Meditations. On 1 January 145, Marcus was made consul a second time. Fronto urged him in a letter to have plenty of sleep 'so that you may come into the Senate with a good colour and read your speech with a strong voice'. Marcus had complained of an illness in an earlier letter: 'As far as my strength is concerned, I am beginning to get it back; and there is no trace of the pain in my chest. But that ulcer [...][note 5] I am having treatment and taking care not to do anything that interferes with it'. Never particularly healthy or strong, Marcus was praised by Cassius Dio, writing of his later years, for behaving dutifully in spite of his various illnesses. In April 145, Marcus married Faustina, legally his sister, as had been planned since 138. Little is specifically known of the ceremony, but it is said to have been 'noteworthy'. 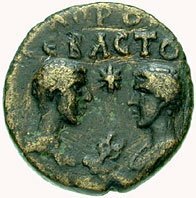 Coins were issued with the heads of the couple, and Antoninus, as Pontifex Maximus, would have officiated. Marcus makes no apparent reference to the marriage in his surviving letters, and only sparing references to Faustina. Fronto was highly esteemed: in the self-consciously antiquarian world of Latin letters, he was thought of as second only to Cicero, perhaps even an alternative to him. [note 6] He did not care much for Atticus, though Marcus was eventually to put the pair on speaking terms. Fronto exercised a complete mastery of Latin, capable of tracing expressions through the literature, producing obscure synonyms, and challenging minor improprieties in word choice. Apollonius may have introduced Marcus to Stoic philosophy, but Quintus Junius Rusticus would have the strongest influence on the boy. [note 7] He was the man Fronto recognized as having 'wooed Marcus away' from oratory. He was older than Fronto and twenty years older than Marcus. As the grandson of Arulenus Rusticus, one of the martyrs to the tyranny of Domitian (r. 81–96), he was heir to the tradition of 'Stoic Opposition' to the 'bad emperors' of the 1st century; the true successor of Seneca (as opposed to Fronto, the false one). Marcus thanks Rusticus for teaching him 'not to be led astray into enthusiasm for rhetoric, for writing on speculative themes, for discoursing on moralizing texts.... To avoid oratory, poetry, and 'fine writing. Lucius started his political career as a quaestor in 153. He was consul in 154, and was consul again with Marcus in 161. Lucius had no other titles, except that of 'son of Augustus'. Lucius had a markedly different personality from Marcus: he enjoyed sports of all kinds, but especially hunting and wrestling; he took obvious pleasure in the circus games and gladiatorial fights. [note 8] He did not marry until 164. In accordance with his will, Antoninus' fortune passed on to Faustina. (Marcus had little need of his wife's fortune. Indeed, at his accession, Marcus transferred part of his mother's estate to his nephew, Ummius Quadratus.) Faustina was three months pregnant at her husband's accession. During the pregnancy she dreamed of giving birth to two serpents, one fiercer than the other. On 31 August she gave birth at Lanuvium to twins: T. Aurelius Fulvus Antoninus and Lucius Aurelius Commodus. [note 11] Aside from the fact that the twins shared Caligula's birthday, the omens were favorable, and the astrologers drew positive horoscopes for the children. The births were celebrated on the imperial coinage. 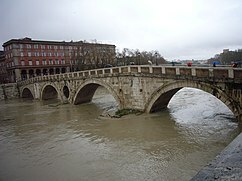 In either autumn 161 or spring 162,[note 12] the Tiber overflowed its banks, flooding much of Rome. It drowned many animals, leaving the city in famine. Marcus and Lucius gave the crisis their personal attention. [note 13] In other times of famine, the emperors are said to have provided for the Italian communities out of the Roman granaries. 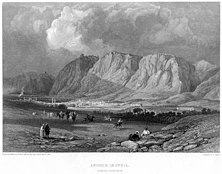 Over the winter of 161–162, news that a rebellion was brewing in Syria arrived and it was decided that Lucius should direct the Parthian war in person. He was stronger and healthier than Marcus, the argument went, and thus more suited to military activity. Lucius' biographer suggests ulterior motives: to restrain Lucius' debaucheries, to make him thrifty, to reform his morals by the terror of war, and to realize that he was an emperor. [note 15] Whatever the case, the senate gave its assent, and, in the summer of 162, Lucius left. Marcus would remain in Rome, as the city 'demanded the presence of an emperor'. 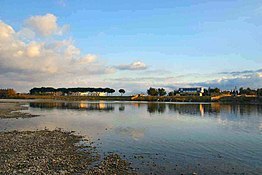 Lucius spent most of the campaign in Antioch, though he wintered at Laodicea and summered at Daphne, a resort just outside Antioch. Critics declaimed Lucius' luxurious lifestyle, saying that he had taken to gambling, would 'dice the whole night through', and enjoyed the company of actors. [note 16] Libo died early in the war; perhaps Lucius had murdered him. A possible contact with Han China occurred in 166 when a Roman traveller visited the Han court, claiming to be an ambassador representing a certain Andun (Chinese: 安敦), ruler of Daqin, who can be identified either with Marcus or his predecessor Antoninus. In addition to Republican-era Roman glasswares found at Guangzhou along the South China Sea, Roman golden medallions made during the reign of Antoninus and perhaps even Marcus have been found at Óc Eo, Vietnam, then part of the Kingdom of Funan near the Chinese province of Jiaozhi (in northern Vietnam). This may have been the port city of Kattigara, described by Ptolemy (c. 150) as being visited by a Greek sailor named Alexander and laying beyond the Golden Chersonese (i.e. Malay Peninsula). 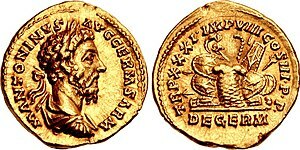 [note 17] Roman coins from the reigns of Tiberius to Aurelian have been found in Xi'an, China (site of the Han capital Chang'an), although the far greater amount of Roman coins in India suggests the Roman maritime trade for purchasing Chinese silk was centred there, not in China or even the overland Silk Road running through Persia.